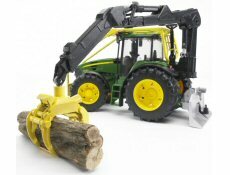 Get the little one into forestry and learn everything there is to know about with the use of forestry toys. Combine the skill of harvesters for cutting down and crafting the trees to a specially equipped tractor for loading the tree trunks on to an awaiting lorry on the road side. Lots of things go into forestry but along the way you'll learn about it all through role play with Bruder and Siku to cut the logs and transport them. Their forestry range includes die-cast and plastic tractors with protective bars over the cabin to Steyr tractors with grabber and trailers and lots of John Deere vehicles to head into the forest. 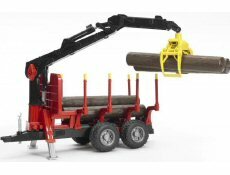 Toy forestry tractors do all the lifting with the long grabber for piling the tree trunks on a trailer. The range includes Siku and Bruder forestry tractors with a protective cage over the cabin and big thread tires. Trucks and trailers for forestry is specially equipped with heavy bars for stopping the logs rolling and big chains to keep it all safe. 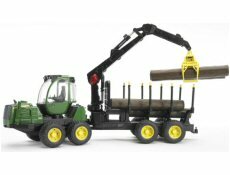 Toy forestry trucks are widely available from Bruder and Siku and fit their matching tractors. You'll need a toy harvester for cutting down trees and load the toy tree trunks on the trailer. They're fitted with large wheels and suspension for rolling over rough terrain. 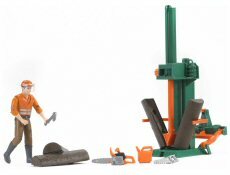 Bring your forestry scene to life with the addition of toy forestry figures with accessories like chain saws. You'll also get a large choice of toy tree trunks and logs to play around with.